Ben and Brea Wang stand in front of their new Wang’s World food truck in South Bethany. The recipe for egg rolls has been in the Wang family for generations, and they have been a hit at family functions, so the Wangs decided to share them with the local resort area. Ben and Brea Wang celebrated their one-year wedding anniversary in June by parking Wang’s World next to their Sandy Pony Donuts food truck near Bethany Beach. With outdoor seating and on-site parking, they’ve created a mini food-truck courtyard on Route 1, just south of Sea Colony. “I really just wanted an item that people could take to the beach as they’re waiting for dinner,” Ben Wang said of the homemade eggrolls and chicken wings. “It’s a food truck. We wanted people to be able to walk up and only wait five or 10 minutes,” said Brea Wang, adding that she particularly loves the oyster eggrolls. The mobile restaurant opened in June, with a name inspired by the couples’ Halloween costume, Brea Wang said. “We dressed as that for a Halloween costume this year, and of course it’s a play off of ‘Wayne’s World,’” the 1992 film based on “Saturday Night Live” characters. Their cartoon-style logo was designed by a friend who is a tattoo artist, based on their Halloween costume photo. The couple had opened Sandy Pony Donuts’ Bethany truck location last summer, after establishing the Sandy Pony food trucks several years ago in Chincoteague, Va., and Annapolis, Md. Growing up and graduating high school together near Annapolis, the Wangs didn’t start with such a yummy business plan. Ben Wang had the entrepreneurial spirit, starting a building company after college, while Brea Wang brought the design element, working as a photographer for NASA in Wallops Island, Va. But the doughnuts got big, and they focused everything into the trucks. And, after a wintertime honeymoon in Thailand, the couple was ready this summer to begin their foray into savory food. Ben and Brea Wang said they love his Chinese family’s recipes but are only showcasing a few here. Most of Ben Wang’s extended family is still in China, but his parents and brother are in the States. 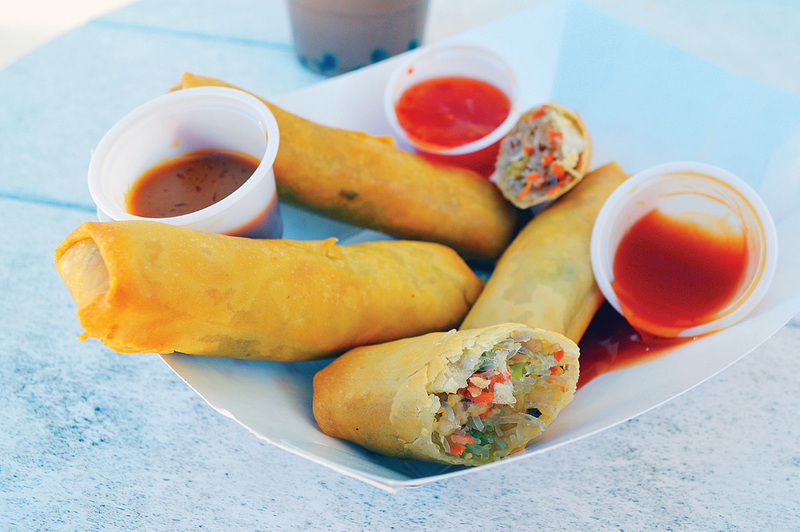 “My mom has always made spring rolls for family events, and every year it seemed to be more requested,” since both his and Brea’s family love them. “It’s not like a normal dish at Thanksgiving dinner,” but they’re happy with their delicious departure from U.S. tradition. The idea for an Asian-inspired food truck developed naturally. The eggrolls start with green bean noodles (similar to delicate glass noodles), shredded carrot and unusual mushrooms. The Wangs encourage customers to be pleasantly surprised by this this Asian mushroom variety. Chicken wings were added pretty quickly, after customers assumed “chicken wangs” were on the menu. Like the eggrolls, the fried wings are served with a choice of sauces: orange zest, sweet Thai chili or sesame-peanut. Bubble tea is a cold, milky tea with chewy, marble-sized tapioca “pearls” — it’s a Taiwanese drink that is hard to find in Bethany Beach, but it fit the Wang’s World Asian theme perfectly. And they already sold bubble tea at the Annapolis doughnut truck, so it was a familiar concoction and one that got added to the Wang’s World menu. Flavors range from mango and strawberry to taro, mocha and matcha green tea. The poke [POE-keh] bowls add a fresh, healthier option. Tuna sashimi is layered over edamame and green bean noodles. The flavor is smoothed with fresh avocado, then zips up with green onion, sesame oil and sesame seeds. “We wanted to make it different from every other poke bowl,” Ben Wang said of the gluten-free dish. They also sell tangy seaweed salad. Water and soda are also available. “Everybody’s loved them,” he added of the new offerings. “We haven’t really done much advertising. Like with the doughnut truck, we pretty much pulled up and opened the windows,” he said, to avoid being overwhelmed with hungry customers. Details about the business are online at www.facebook.com/Wangs-World-Bethany-Beach-1798165876871386/ and www.instagram.com/wangsworld_bethany. Wang’s World will be open until autumn at 33230 Coastal Highway, south of Bethany Beach, next to Atlantic Shoals Surf Shop on Route 1. Call (301) 775-2005 for more information. Wang’s World is open daily from 10:30 a.m. to 8 p.m. Sandy Pony is open daily from 8 a.m. to 5 p.m.